Whether you are spending a few days relaxing in San Pedro or you are planning to move full-time to Belize, you'll have countless options for ways to spend your days. Between the glorious beaches, the warm weather and the exciting culture, there is no shortage of things to do, see and explore in San Pedro, Belize. However, many visitors gravitate towards the incredible amenities shared by the Gran Pacifica Beach & Golf Resort and the Exotic Caye Beach Resort. 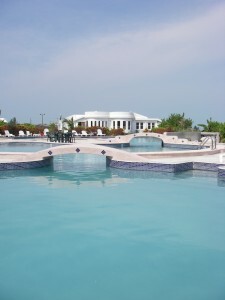 Whichever property you are staying on, make sure you visit the incredible and inviting San Pedro Belize Fitness Club. Without question, one of the biggest highlights at the fitness club is the outdoor swimming pool. Although the beach is just a short walk away, many people prefer the safety and convenience of this wonderful pool. Kids, in particular, can enjoy plenty of splashing in the nearby kiddie pool without leaving the watchful eye of their parents. The main pool holds a whopping 250,000 gallons, making it big enough to accommodate plenty of guests. Whether you want to cool off with a cocktail in hand, make a few new friends or stay fit by swimming laps, the large pool at the fitness center can definitely meet all of your needs. When you're on vacation, there is no need to stay active on your own. Whether you want motivation, encouragement or just someone to chat with as you get in your daily exercise, the fitness classes on-site can be the answer. You might start out your day with some yoga or Tai Chi, or you could work up an appetite with water aerobics or even kickboxing classes that have a high-energy atmosphere. Of course, those who want to lift weights, run on the treadmill or otherwise get fit can do so at the fitness club. The air-conditioned gym is a large facility boasting all of the machines you rely on most. Just steps from the accommodation and condominiums at Gran Pacifica, you can start or end your day on the right foot with a high-quality workout in a beautiful location. More big highlights of the fitness club in San Pedro are the courts, which are perfect for tennis and volleyball. Whether you want to practice your skills solo or play a match with a friend, this is the place. Plus, the area is illuminated at night to let you take advantage of the cooler temperatures. There are also places where you can play miniature golf or simply practice your putt before teeing off over at the nearby golf course.